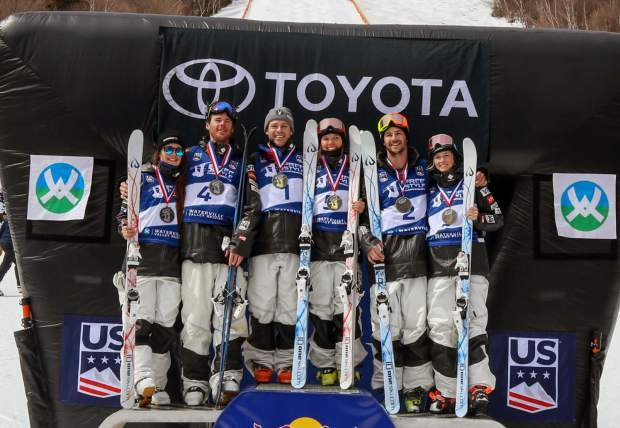 From left is Jaelin Kauf, Dylan Walczyk, Brad Wilson, Tess Johnson, Troy Murphy and Keaton McCargo celebrating their dual moguls podium finishes at the 2018 U.S. Freestyle Championships. Back from the Olympics and coming off her first World Cup win in dual moguls, Ski & Snowboard Club Vail’s Tess Johnson skied to her first national title on Saturday, March 24, while Brad Wilson landed his second win of the weekend at the 2018 U.S. Freestyle Championships at Waterville Valley Resort, New Hampshire. Johnson, 17, has consistently finished in the top five at Nationals for the past two seasons. She was finally able to break on to the podium with a 20-15 victory over teammate Jaelin Kauf and Keaton McCargo, who won Friday’s moguls championships, claimed her second podium of the weekend with a third place finish. Wilson skied strong through many tough duals. He found himself up against teammate SSCV’s Dylan Walczyk in the big final and took the win 21-14. Troy Murphy and SSCV’s Emerson Smith battled it out in the small final where Murphy took the win for third place. A day earlier, Keaton McCargo and Brad Wilson took home moguls titles on at the 2018 U.S. Freestyle Championships at Waterville Valley Resort, New Hampshire. It was McCargo’s second consecutive title and Wilson’s fourth-career title. McCargo progressed through the day, qualifying sixth into finals before taking the win with a score of 84.15. Steamboat Springs Winter Sports Club athlete Avital Shimko was second with a score of 83.47 followed by Olivia Giaccio in third with a score of 82.89. Wilson maintained his lead after posting the highest score in qualification. He took the win with an impressive 88.29. Ski & Snowboard Club Vail’s Jesse Andringa was second with a score of 87.07 and Dylan Walczyk was third with an 85.91. With the 2018 U.S. Freestyle Championships wrapped up, the U.S. Ski Team moguls athletes look to begin preparations for the 2019 season.